Last November, I found myself in Pizza Hut for my dear sis's birthday party. I've been meaning to write this little review for a while now, but better late than never, eh? Ok, so first of all, I think Pizza Hut deserve a round of applause for their unlimited salad bar...every restaurant needs one of those. I am particularly impressed by the variety of vegetables and pulses on offer. I would even go so far as to say that it is actually possible to construct a filling, wholesome lunch based solely on that salad bar. Alas, you go to a pizza restaurant to eat an actual pizza and so I ended up ordering the 'Veggie Hot One' topped with olives, cherry tomatoes, red onion, peppers and green chillies - without the cheese. I half-expected a look of surprise on the waiter's face, but nope, my request seemed to pass as perfectly normal. Thumbs up for customer service. The pizza: While I think the sauce could have done with a bit more seasoning (I guess the bulk of the taste would normally come from the cheese), overall I was happy with my meal. I did miss having something to hold all the veg together though - more than a couple of those sneaky olives slid onto my lap as I tried to take a bite. More than anything, I was also secretly relieved that I could effortlessly get on with enjoying the day with everyone, munching away on my cheese-less pizza (which is not as sad as it sounds :p). Even though this post is specific to Pizza Hut, I think it can apply to just about any pizza restaurant out there. Any restaurant that cares enough about its customers will be willing to meet all sorts of dietary requests. It's just a matter of the customer being vocal (and polite) about it. What's your take on the cheese-less pizza? As I'm not a fan of cheese, I wouldn't mind trying a cheese-less pizza. Remember I mentioned using hummus to make a home made pizza one time? Hmm will definitely try it...as of today I am vegan and so far its been great other than my husband not thinking I will last. We always go to nandos for Sunday lunch and I'm looking forward to experiencing Nandos as a vegan. 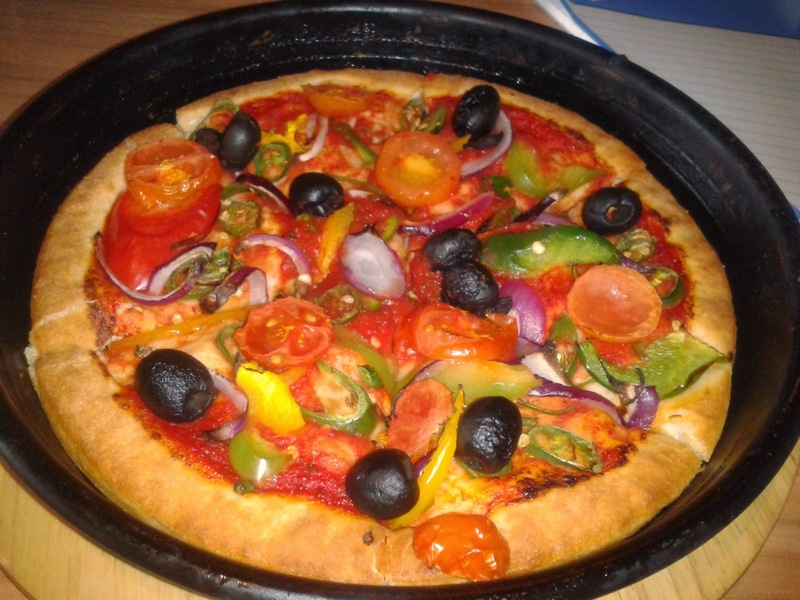 Its good to know pizza hut does a vegan pizza as they are next door to Nandos and I can alway pop in if Nandos fails.